Oil & Gas | Indelac Controls, Inc.
Oil and gas production operations rely on the ability to manage the flow of various gases and liquids through a complex and continuously expanding network of pipelines. This is made possible using valve actuators. Valve actuators are commonly used to control or manage the flow of crude oil, gas, condensate, and water in both onshore and offshore applications. Valve actuators must withstand rigorous conditions and adhere to regulations set forth by governments and international regulators. During production – particularly in the upstream phase – hydrocarbon temperatures and pressures are higher, and their contents contain greater levels of corrosive gases such as carbon dioxide (CO2) and hydrogen sulfide (H2S). Furthermore, most actuators operate in volatile environments which exist under normal working conditions, so all equipment must withstand harsh environments and operate safely in the presence of flammable and explosive atmospheres. At ICI, we offer products that meet or exceed petrochemical standards and regulations. We custom manufacture a wide array of durable electric actuators that are certified for operation in hazardous indoor and outdoor environments in the oil and gas industry. 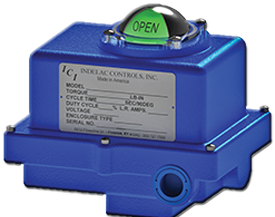 ICI’s electric actuators offer superior repeatability, response frequency, control, and reliability for all critical operations. In particular, our line of fail-safe spring return electric actuators has been designed with safety as a number one priority, making them ideal for the strict requirements of oil and gas applications. These actuators are available with NEMA 4 and 4X, NEMA 7 and NEMA 9 enclosures and coupled with the fail open/fail close features to ensures process safety and reliability for many years of trouble free operation. These actuators they can function operate efficiently in even the most hazardous environments. In addition, our spring return electric actuators are available in six different models with varying specifications and torque capabilities that ensure a suitable solution can be found for any situation. If you would like to learn more about our electric actuators or need advice on how to select the right one for your petrochemical application, please contact our experts or request a quote.